Studies from embryonic stem cells and other cellular models have revealed that a small group of cell-type-specific or lineage-specific transcription factors (TFs) forms an interconnected autoregulatory loop to govern transcriptional programs in particular cell types1-3. 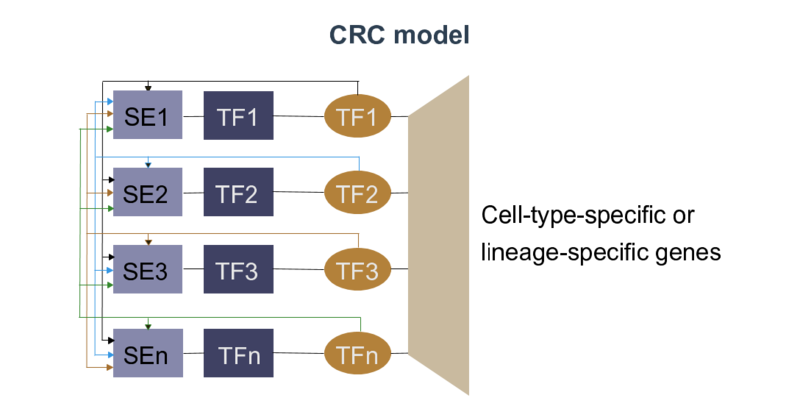 Core transcription regulatory circuitry (CRC) constitutes the core TFs and their interconnected autoregulatory loop, both of which are critical to maintain cell identity and cellular state4. 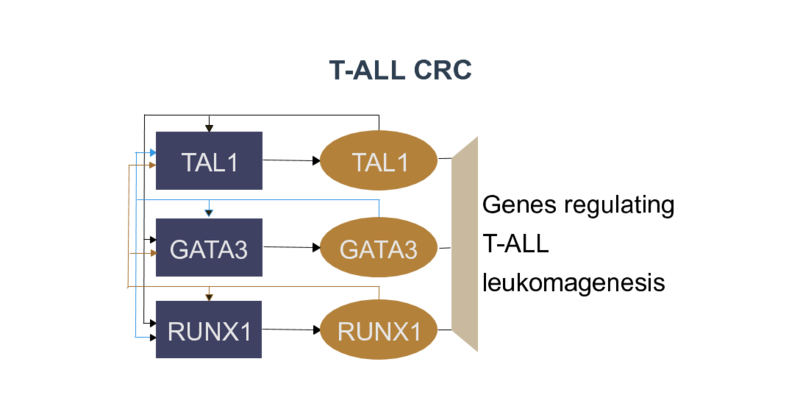 dbCoRC, published in 2018 NAR, is the first comprehensive and interactive database of CRCs. It contains CRC models from 188 human and 50 murine samples base on computational analysis of H3K27ac ChIP-Seq data. For further information, please see Statistics. The dbCoRC website also integrates mRNA expression data of individual core TFs within a reconstructed circuitry, with a special focus on healthy and diseased human cells/tissues. Therefore, dbCoRC provides valuable resources and important insights for scientific communities to facilitate further analyses of both cell-type-specific transcriptional regulatory program and disease-specific transcriptional dysregulation. Boyer, L.A., Lee, T.I., Cole, M.F., Johnstone, S.E., Levine, S.S., Zucker, J.P., Guenther, M.G., Kumar, R.M., Murray, H.L., Jenner, R.G. et al. (2005) Core transcriptional regulatory circuitry in human embryonic stem cells. Cell, 122, 947-956. Odom, D.T., Dowell, R.D., Jacobsen, E.S., Nekludova, L., Rolfe, P.A., Danford, T.W., Gifford, D.K., Fraenkel, E., Bell, G.I. and Young, R.A. (2006) Core transcriptional regulatory circuitry in human hepatocytes. Mol Syst Biol, 2, 2006 0017. Sanda, T., Lawton, L.N., Barrasa, M.I., Fan, Z.P., Kohlhammer, H., Gutierrez, A., Ma, W., Tatarek, J., Ahn, Y., Kelliher, M.A. et al. (2012) Core transcriptional regulatory circuit controlled by the TAL1 complex in human T cell acute lymphoblastic leukemia. Cancer Cell, 22, 209-221. Saint-Andre, V., Federation, A.J., Lin, C.Y., Abraham, B.J., Reddy, J., Lee, T.I., Bradner, J.E. and Young, R.A. (2016) Models of human core transcriptional regulatory circuitries. Genome Res, 26, 385-396.